Stone Rock Pizza01291 621616work Restaurant - ItalianStone Rock Pizza is a Multi National Award Pizzeria situated in the centre of Chepstow just a few minutes walk from the Castle and tourist Information centre. Our dough is homemade and cooked in a traditional Italian Clay Oven. Most of our ingredients and toppings are sourced locally or from Italy directed using only the finest quality. We serve both alcoholic and soft drinks, have both indoor seating and a beautiful Mediterranean Conservatory and Garden. We offer Gluten Free and Vegan, Starter, Pizza and Dessert Options. We won the Gold Award for Best Independent Pizzeria in the UK from the Pizza and Pasta Association, and The Best Pizza in Wales (from a Pizzeria) at The Welsh Italian Awards. Stone Rock Pizza is a Multi National Award Pizzeria situated in the centre of Chepstow just a few minutes walk from the Castle and tourist Information centre. Our dough is homemade and cooked in a traditional Italian Clay Oven. Most of our ingredients and toppings are sourced locally or from Italy directed using only the finest quality. 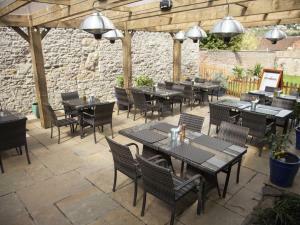 We serve both alcoholic and soft drinks, have both indoor seating and a beautiful Mediterranean Conservatory and Garden. We offer Gluten Free and Vegan, Starter, Pizza and Dessert Options. Open throughout the year from Tuesday to Friday from 5pm and All day Saturday and Sunday from 12 noon.